When my nephew visits each summer, most of his time is spent with the neighbour’s kids but I try to get him involved in a hand tool project as well. 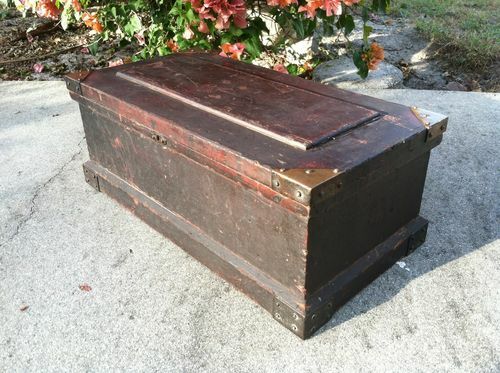 This year we did a small version of the anarchist’s tool chest, based on this old box I found on the web. He’s still a bit young and finds the tools awfully heavy, so I just have him do a little bit of each process and allow him to rejoin their Wii Smash Bros game. I saved a lot of time by using only standard widths of select clear 3/4 pine. Also, the lid is lap jointed rather than through tenoned but it seems like a very sound joint because apart from the glue, the groove-in-groove panel holds it from the inside while nails through the dovetailed skirt hold it from the outside. When I make my full-sized version some day, I might just use lap joints. The bottom skirt is dovetailed but the dust seal is only mitred. I plan to do a couple of tills and will build a brake to fabricate the brass corners for the holidays. It was a super fun project and progressed very quickly because (for a change) I didn’t get caught up in dimensioning a lot of rough wood by hand. The handles and hinges came from the hardware store and were soaked overnight in vinegar to remove the zinc plating. The lock is the Lee Valley black japanned version and required a considerable bit of work with a file before the registration pins lined up properly. I invested in a set of Lee Valley gimlets for pre-drilling the screws and they work great. If you’re working in 3/4 pine, 1 & 1/4” square nails are the best length. The skirting was glued and fixed with square headless brads. Very nice project. It should be in the family for a long time. You are definitely in the running for Uncle of the Year. Looks like terrific fun and a well done project! Nice build, nice story and great tradition with your nephew. The best part is you are building a foundation for either a future career or beloved hobby with your nephew. As for the lap joints, we do have an edge with our modern glues. They allow us to do things our ancestors only dreamed of. Have you looked at Roy Underhill’s jointers tool chest? He uses a bridal joint on the lid. Doesn’t look too hard, but gives lots more glue surface. -- "Necessity is the mother of invention"
Yes, a bridal joint would be a better solution but time was very short and I figured that the lap joints mean’t only needing to true up 8 cheeks and shoulders. Bridal joints would mean doubling that and then cutting away the mortised bit and hoping the frame lay flat, so it seemed like more chances to screw up and with the wood being only 3/4, I wouldn’t be able to plane down very much to correct it. I decided to stick to what was done on the original and was suprised how well the frame and paneI “locked” together before glue up. Unforunatetly, I think I might be teaching my nephew after the manner of his grandpa, who could be a little impatient at times. He’ll either love woodworking or hate it, though I’ve noticed that he doesn’t seem driven to build things the way I was at his age; making rope, arrows, macramè, balsawood airplanes., etc. I was shocked to find that kids today like to go to youtube and watch 25 year old man/boys talk in silly voices as they play video games. I admit to wasting a lot of time in front of the TV as a kid but this seemed somehow beyond my imagining.